In the not so distant past facial rejuvenation was focused on skin surface treatments like chemical peels, light therapy and skin resurfacing coupled with the more invasive surgical tissue facelifting procedures. Recent advancements saw treatment expanding with cosmetic doctors understanding of muscle relaxation through neurotoxins and more importantly the advancement of our knowledge of how loss of fatty tissue in the face results in the classic features of the aging face. 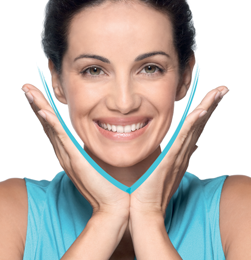 At Castleknock Cosmetic Clinic we can now add volume to restore the youthful luster of the face. In order to achieve a natural looking correction for my patients, I use a combination of muscle relaxing injections, skin resurfacing and tightening, as well as volume restoration. In suitable patients, such combined approach will yield results similar to formal face lifting procedures but without the downtime and extensive trauma.